Here’s a fellow who may have too much time on his hands. Dr Mohamed Babu set up these photos after his wife noticed that ants turned white when they sipped spilled milk. 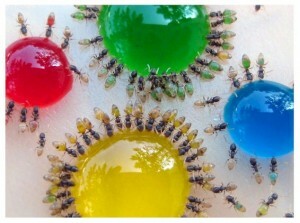 The scientist mixed sugar drops with edible colors red, green, blue and yellow and placed them in his garden to attract the insects. As the eager ants bellied up to the bar to enjoy the sweet treats, the color of the sugar they had chosen could be seen in their transparent abdomens. Some varied their choice, creating different colour combinations inside them. Dr Babu 53 of Mysore, southern India explained that “The ants gain the colors as they sip the liquid. The secret is a paraffin base, which prevents the drops collapsing.